You have to reflect . . . when a prince is powerful and brave, he can make peace as he wishes. If, however, he is powerless, some more powerful than he will conquer him and dictate as he pleases. Dracula had paid tribute to the Ottoman Empire for the first three years of his second reign, 1456-1459; however, beginning in 1459 he was consumed with the campaign against the Transylvanian Saxons and the flow of tribute stopped. Mandatory visits to the sultan’s court by Dracula also ceased, and the Turks, already uneasy about Dracula due to his support from the Hungarian crown, were at a breaking point in their relations with Wallachia (McNally and Florescu 46). Dracula attempted to balance his competing oaths of fealty to both Hungarian and Ottoman rulers, yet he was no more successful than Vlad III Danesti, nor any other Wallachian ruler. Their position, politically, militarily, and geographically was simply untenable; however, whereas Vlad III ended up fighting for his Turkish overlords, Dracula fought against them. The breaking point in Ottoman-Wallachian relations occurred when the Turks began demanding an annual tribute of five hundred boys for their elite Janissary corps. These children would be indoctrinated into Islam and then sent to fight against Christians. Tensions further increased when Turkish army recruiters sent to Wallachia for the purpose of identifying candidates were summarily impaled (McNally and Florescu 46). Still, negotiations between the two sides continued and Sultan Mehmed II, with whom Dracula and his brother Radu knew from their youth as hostages in the Ottoman court, made a final demand. In order to keep the peace, Mehmed II demanded Dracula present himself in court and make his tribute, including the youthful recruits for the Janissaries, in person. Knowing that the Sultan would likely seize him and put his brother Radu, a member of the sultan’s court, on the throne, Dracula refused (McNally and Florescu 47). 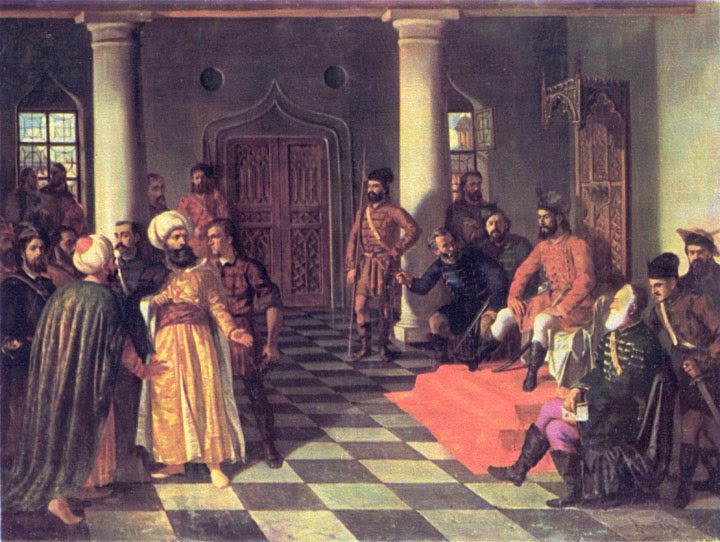 Fig 1: Vlad the Impaler and the Turkish Envoys, by Theodore Aman. In that one stroke, the war was on and a tiny principality would dare defy an entire empire. I have killed men and women, old and young . . . [we killed] 23,884 Turks and Bulgars without counting those whom we burned in homes or whose heads were not cut by our soldiers . . . thus Your Highness must know that I have broken the peace with the sultan. Radu, who was rumored to have been the sultan’s lover in his youth, now served the Ottomans as a willing as a convert to both Islam and the Ottoman agenda of sovereignty over the Balkans in general, and specifically Wallachia. Dracula not only learned how the Turks fought from his long years as a hostage in the court of the sultan, but under John Hunyadi he learned effective tactics to battle the Turks, including amphibious warfare and the use of mobile battle wagons. The combination of both gave Dracula a deep understanding of the strengths and weaknesses of the Ottomans, which he exploited to his full advantage (McNally and Florescu 48). 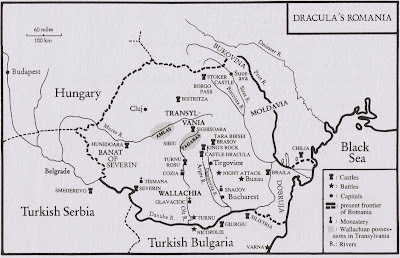 Dracula kicked off his campaign with a thunderous blow against the Turks, as noted in the above passage where he details his initial successes to King Matthias Corvinus in a letter dated February 1, 1462. To prove his body count to the king, Dracula sent along two bags of severed heads, noses, and ears (McNally and Florescu 49). Sultan Mehmed II responded to Dracula’s winter campaign against the Turks along the Danube River in 1462 that spring by invading Wallachia with approximately 60,000 troops (Florescu and McNally 139). Dracula had no more than 30,900 men, according to Slavic chronicles. To bolster his numbers, Dracula called all able-bodied males 12 years of age and older to join his campaign. Even women were pressed into service (McNally and Florescu 49). Unable to resist the crushing numbers of the Ottoman army, Dracula resorted to asymmetrical warfare, engaging in guerrilla tactics to delay, disorganize, and demoralize the enemy. He withdrew from the Wallachian plains in the south to the Transylvanian mountains, burning what he could not carry. Crops and food stores were burned, livestock killed, wells poisoned, and whole villages razed to the ground (McNally and Florescu 51). In a time before refrigeration, C-rations, and meals ready to eat (MREs), armies had to live off the land and forage for their food and water, and 60,000 men get very hungry and very thirsty very fast. The summer of 1462 was the hottest on record to date, and under the hot blazing summer sun, with dwindling supplies, harried by attacks against their supplies lines, and chasing an elusive prey, Turkish moral began to waver, but the worst was yet to come (McNally and Florescu 51-52). Dracula released criminals to attack the Turkish stragglers. Those infected with various diseases, such as the plague, were sent in disguise into Turkish camps to spread their disease. 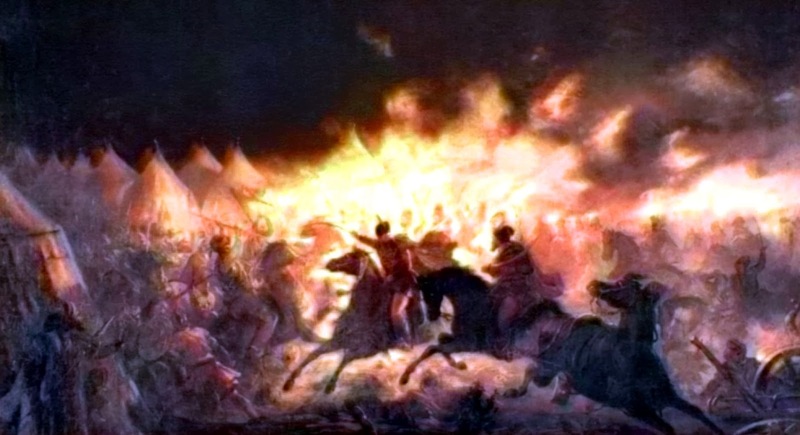 Many notable actions took place between the Turks and Wallachian forces, but two events that stand out include the Night of Terror (July 17, 1462), and the march on Tȋrgovişte itself (McNally and Florescu 51). Despite Dracula’s harassing actions, Mehmed II continued steadily towards Tȋrgovişte. Knowing that a traditional field battle would totally destroy his forces, Dracula devised a bold plan to attack the Turk’s camp at night and kill the sultan — cutting the head off the snake in his den. Such a move could potentially rout the slowly demoralizing Turks. Using his intimate knowledge of the land, Dracula would be able to move his forces up through hidden paths into the camp itself (McNally and Florescu 52). The attack was a masterstroke and thousands of Turks, perhaps up to 15,000, were brutally murdered as they slept, cut down as they went for their weapons, or as they cowered in fear. Dracula got within sight of the sultan's tent, but was driven back. The attack was a total surprise and terror spread through the Ottoman ranks (McNally and Florescu 53). Fig. 3: A depiction of the Night of Terror: The Battle with Torches, by Theodore Aman. Dracula, who was being surrounded by the rallying Turkish forces, eventually retreated. According to a letter by papal legate Niccolo Modrussa reporting a conversation he had with Dracula, Mehmed II, did initially flee after the battle, but was compelled by his advisers to return and claim a tactical victory as Dracula’s forces withdrew (Florescu and McNally 145-146). Despite their overwhelming surprise, the Wallachians had reportedly lost about 5,000 soldiers it could ill-afford to lose. Knowing he could not confront the Sultan again, Dracula fled north, leaving the Turks to approach Tirgovste unchallenged (McNally and Florescu 53). Fig. 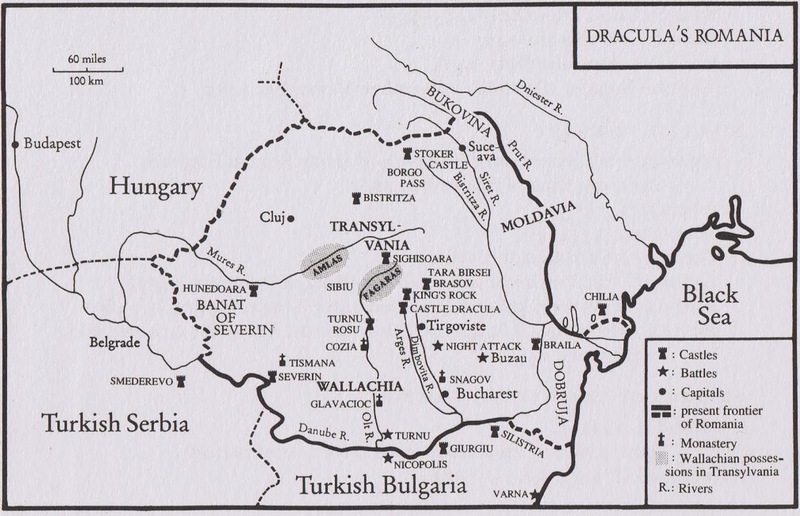 4: Dracula's Romania: Mid-15th Century Wallachia (McNally and Florescu 187). Attempting to discover Dracula’s plans, a Wallachian soldier was captured, but did not speak. Though sawed in half, the dying Wallachian feared Dracula more than the Turks. This small story symbolizes the fear Dracula held over his own people, and which extended towards his enemies (McNally and Florescu 53). Marching towards Tȋrgovişte, Mehmed II found the gates shut and city prepared to defend itself. Rather than put his already demoralized army into a long siege with few supplies, Mehmed marched around the city, tracking Dracula’s movements until they came to a small gorge about sixty miles north. There, the Turks found some 20,000 men, women, and children — mostly Turkish prisoners and some traitorous Wallachians — impaled in a semi-circle approximately a mile in diameter. 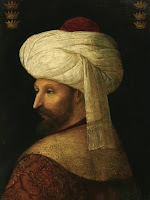 The two highest stakes contained the bodies of the two envoys Mehmed II had sent earlier that year to secretly capture Dracula (Florescu and McNally 145-146). The stench must have reached the noses of the Turks long before they set eyes on the gruesome scene. Bloated bodies rotting in the hot summer sun, birds nesting in body cavities — it was an image of hell that even Old Testament fire and brimstone prophets could not have dreamed. That night, Mehmed ordered a trench dug around his encampment and in the morning they retreated back to the Ottoman Empire (Florescu and McNally 147-148). 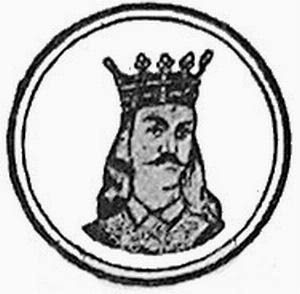 19th Century portrait (“Radu al III”). Radu’s call quickly began to deplete Dracula’s ranks and he moved to take the throne for himself. Fleeing towards the Carpathian Mountains, Dracula sought support from Hungarian King Matthias Corvinus. After weeks of negotiations, Corvinus gave Dracula a unit of soldiers to complement his dwindling ranks. In reality, the king was arranging for his men to separate Dracula from the Wallachian troops and bring him under arrest to the Hungarian court (McNally and Florescu 95). The conflict in the border region had to cease and with Radu in power the Turkish beast would be held at bay, for now. As Dracula learned, no good deed goes unpunished. Dracula proved to be popular in European courts for his successful campaigning against the Turks, so Corvinus embarked on a PR campaign to justify his arrest of the Impaler Prince. Popular opinion sided with Dracula, but war is always a brutal experience, and even more so during the twilight of Medieval Europe. The prospect of peace, however obtained, eventually placated opposition (Florescu and McNally 161-162). For twelve years, between 1462 and 1474 Dracula languished as a prisoner of the Hungarian king. Occasionally, he would be trotted out for state occasions as an object of intimidation, such as when a Turkish delegation arrived at the Hungarian court to conclude a peace treaty (Florescu and McNally 163). Two independent accounts of Dracula during this time reveal a truly disturbed mind. The Russian ambassador Fedor Kuritsyn reported Dracula’s “. . . evil habit of catching mice and having birds bought at the marketplace, so that he could punish them by impalement.” A separate account by Gabriele, Bishop of Erlau to Pope Sixtus IV in 1476 said, “. . . he caught mice and, cutting them up into pieces, stuck them on small pieces of wood, just as he had stuck men on stakes” (Florescu and McNally 163). The connection today between animal abuse and serial killers is well known, so it is remarkable that two separate contemporary accounts would note this behavior. Dracula’s socio-psychopathic behavior was so extreme that it stood out in a time when violence was commonplace and brutality an accepted part of life. In January 1475, Radu died, reportedly of syphilis, giving Dracula an opportunity once again to take the Wallachian throne for a third time. Corvinus, who had long plotted to move against the Turks, now saw his opportunity and pledge Dracula his support to return him to power. The catch was Dracula would have to abandon his Eastern Orthodox Christian faith and become a Catholic. This would allow Dracula to marry within the Hungarian ruling family, providing a direct link between the Hungarian crown and the Wallachian principality, securing it as a buffer state against the Ottoman Empire (Florescu and McNally 163). By the summer of 1476, Dracula, with Corvinus’ support gathered an army In Transylvania, working with his cousin Stephen the Great to move against the Turks in Moldavia and return the crown to Stephen’s hands. Now, ready to return the favor, Stephen gathered his troops to restore Dracula to power in Wallachia, and in early November 1476 they began their campaign. The battles against the latest Wallachian voivode, Basarab Laiotă were bloody, but by the end of month Dracula was back in control of the nation (Florescu and McNally 171-172). This third reign though was not to last. Basarab quickly joined forces with the Turks and moved against Dracula in December 1476. By the end of the month, the Son of the Dragon met his death not far from the monastery at Snagov; perhaps at the hands of an assassin, perhaps at the hands of his own men who mistook Dracula for a Turk — owing to his habit of disguising himself as such to spy on their forces. Whatever the case may be, Dracula was beheaded and his head sent to the Sultan to assure him that the Impaler Prince was indeed finally dead. As we all know, however, Dracula never really died, did he? Despite Dracula’s success on the battlefield against the Ottomans, he only slowed them down. They continued their push through the Balkans until they finally lay siege to Vienna itself in 1529 and again in 1683, before finally being turned back. With Dracula, we see that the desire for power was absolute. He was willing to do what it took to stay in power: change faiths, shift allegiances, and torture and kill to a degree that staggers the imagination to this day. The religious conflicts between Christian and Muslim in the Balkans continued to be played out during the 1990s following the breakup of the former Yugoslav Republic. Death camps and torture returned. Ancient enmities were played out in regions were both Dracula and his father once battled the Turks. Dracula cast a shadow that stretched long beyond his time, revealing the terrible nature of man that endures to this day. The dragon would be proud. This classic 1977 episode of In Search of . . . , narrated by Leonard Nimoy, first peaked my interest in the real-life Dracula. Footage from Transylvania during the communist-era Romanian government makes this episode unique. From my personal archives. Aman, Theodore. The Battle with Torches. Pure Romania. Romania. Pure-Romania.com, 2013. Web. 29 Oct. 2013. <http://pure-romania.com/landmarks/land-of-dracula/>. Houghton Mifflin Company, 1994. Print.